Sunset Park has seen a substantial amount of infill proposals in the past few months alone, and that trend is only set to continue, with plans now in the works for a commercial redevelopment at 617 62nd Street. Angelo + Anthony Ng’s Architects Studio NY will be designing the site, which will yield a five-story building with a fairly impressive envelope. 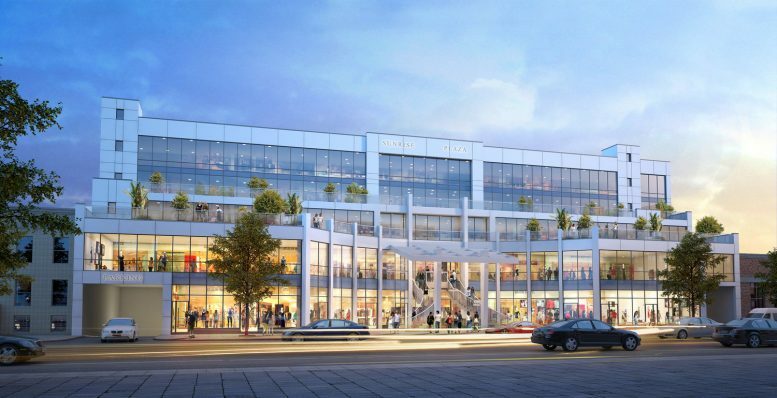 According to the architects, the cellar will include an 18,000 square foot supermarket, while the first floor will contain 10,000 square feet of retail space. The second floor will have a 10,000 square foot restaurant, and the third through fifth floors will have 28,000 square feet of space for medical offices. The only applications filed with the Department of Buildings for the site so far are demolition permits, which were approved back in December. The new structure will likely be a mix of commercial and community facility space, as “medical offices” are a favorite for occupying the latter component of Outer Borough new developments. Renderings by Architects Studio NY show an envelope that will massively improve the site and its surrounds, with an inset in the middle of the project that will emphasize its pedestrian-centric nature. That will yield to terraces above the second floor, and another setback after the third floor. The building itself will be faced in white paneling and floor-to-ceiling glass. No completion date has been announced yet, but the project has tentatively been dubbed “Sunrise Plaza”. A 2019-2020 estimate would not be unreasonable. 2 Comments on "Reveal for Commercial Development Coming to 617 62nd Street, Sunset Park, Brooklyn"
Wow – Sunset is ready for its close up!